Where does art stand within the broader landscape of mass commerce today? To answer this question, Artforum editor Tim Griffin sat down with retail anthropologist Paco Underhill, author of the best-selling books Why We Buy: The Science of Shopping (1999) and Call of the Mall: The Geography of Shopping (2004). Founder and CEO of Envirosell, Underhill studied with social scientist William H. Whyte before going on to observe the circulation of automotive and pedestrian traffic in and around urbanand, more specifically, commercialspaces. He has advised a spectrum of clients ranging from Saks Fifth Avenue and Starbucks to the Smithsonian Institution and the National Gallery of Art in Washington, DC. The following conversation took place in Envirosell’s headquarters in downtown Manhattan. 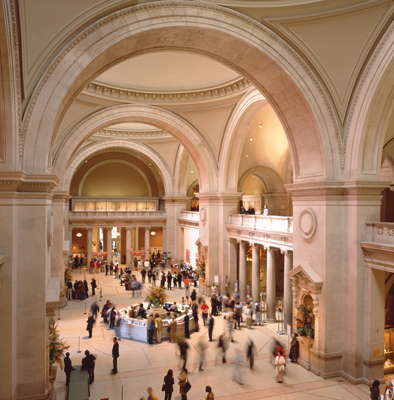 Great Hall, Metropolitan Museum of Art, New York, 2002. Photo: Brooks Walker. Tim Griffin: Among my favorite arguments in all of art criticism is Meyer Schapiro’s assertion that the late nineteenth-century avant-garde always bore the inscription of mass commercethat in its subjects, techniques, and modes of attention, one finds reflections of the day’s arcades, as well as of its constructs of work and leisure. Given your work both with art institutions and retail environments, I’ve long wanted to get your views on their common and distinct traits today. And so, to begin with general impressions, how might you situate galleries or the museum in the greater landscape of contemporary commerce? Paco Underhill: Can I organize this differently?